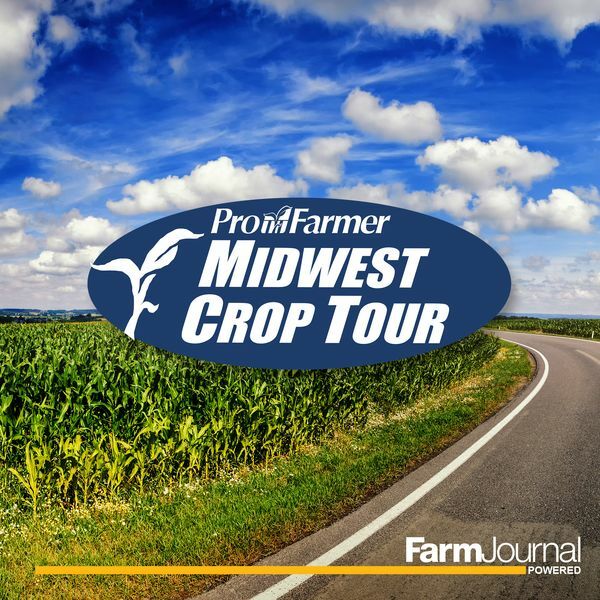 Pro Farmer Crop Tour scouts put in a long, hard day’s work in Indiana and Nebraska Tuesday, pulling around 500 samples each of corn and soybeans to feed the day’s yield estimates. Yields, despite some challenges, were impressive in both states. Indiana corn jumps to 182.33 bu. per acre and soybeans hit 1311.87 pods per 3X3 square. Eastern Pro Farmer Midwest Crop Tour lead Brian Grete says there’s still room for upside potential in corn, however. It’s an advanced year for maturity, too. While there is more tip back in Indiana than scouts saw during Monday’s scouting in Ohio, the state is on its way to an impressive corn final yield, increasing 6.5% over last year’s 171.23 bu. per acre, driven by higher ear counts. It also dominated the three-year average of 162.53 bu. per acre. However, Pro Farmer is coming in just below USDA’s Aug. 1 estimate of 186. Soybeans are looking impressive as well, with a 12.2% jump over 2017’s 1188.78 pods per 3X3 squares. It also beat the three- year average of 1146.76. With moisture, the team did see few spots with ponding and on a scale of 1:6 for moisture came in at a 5.1. So moisture is still very high for soybeans. After more than 300 samples, Nebraska corn pulled 179.17 bu. per acre and soybeans met 1299.08 pods per 3X3 square. This includes irrigated (60%) and non-irrigated fields (40%). The corn crop is 38% dented and Pro Farmer’s estimates agree with USDA’s increase at 8.3% over the 2017 growing season’s 165.42 bu. per acre. It also beat the three-year average at 163.06 bu. per acre. With fields this far along, farmers could be harvesting corn, and real data, in just two weeks. Ear count is up, too, at 1.8% higher than last year. Wilson was surprised that number wasn’t higher, but he did see a few misses, skips and signs of replant in some fields. He also did see some disease problems that dropped ears and a few bug problems here and there. Overall ear length hit almost 7.3” though. Soybeans are packed with pods, and boosted estimates by nearly 15% over last year’s 1131.02 and also above the three-year average of 1191.37. “I counted one plant today that had 5s and 4 bean pods,” Wilson says. Scouts did see a few disease issues in Nebraska, sudden death syndrome and a few other diseases. But overall, fields were pretty healthy. And, Nebraska farmers controlled their weeds better this year than in recent history.